I remember when I got my first iPhone back in 2012 and I discovered the magical world of Twitter. I started making all these connections with people who have the same interests as me and who I know I never would’ve been lucky enough to meet otherwise. I always loved having websites (back in the AOL Hometown, Angelfire, Xanga, etc. days) but those were mostly dedicated to the flashiest most headache inducing pixelated graphics or angsty high school ‘this-is-my-current-mood-and-favorite-song’ type posts. It hadn’t ever occurred to me to start my own blog until I saw this brand new world unfold in front of me on my tiny Apple screen that I realized that pretty much anything is possible! I liked such niche things for most of my life (most of which are now very prevalent in mainstream pop culture) and I hadn’t ever had a place where I could truly express my opinions and gush about the things I loved so I decided to create that space for myself. And thankfully, I had the help of one the best web designers on the planet to turn my blog into a place I love completely that perfectly represents me and my interests. Your posts vary from book reviews to fashion, to personal goals. What drives your content? My content is really just reflective of whatever I’m very passionate about at the time. I used to post more personal and event based posts which is something I’ve been planning on reintegrating. Then I also experimented with media news posts which I quickly realized is more impersonal and not something I want to spend my time writing because you can find the same types of stories on so many other platforms. (Although, I did start a news series on my YouTube channel for bookish and geek news which I’m really loving! I think the round up format works better for me because I can highlight the things I’m most excited about without having to write an individual post for each piece of news.) I do also love incorporating fashion posts. I went to college at The Fashion Institute of Technology so fashion has always been a huge part of my life and I love it even more now that I tie those posts back to books or comics. And as for personal goals, those posts are mostly for me (although the personal posts seem to get the most attention- especially my husband Andrew’s amazing Harry Potter proposal to me!). I also co-created a weekly blog meme called 5 Fandom Friday where Megan of The Nerdy Girlie and I come up with a list of prompts for every Friday of the month (always fandom related in some way) and release the list to the Female Geek Bloggers Network to inspire other girls to share their answers and get involved. But my favorite posts to write are book reviews, especially now that I changed up my format and I’ve been using my own photography instead of pulling an image of the book cover from google. I know that I’ve been trying to be more active on my blog, how does organization play a role in posting consistently? Do you have a posting schedule that you stick to? You went to school for fashion. How does that influence the way you approach your passions? I did! I think that because of my fashion background, I have a clear vision of the things I’m drawn to and I pay very close attention to detail. It’s also helped me become really intuitive at noticing patterns and cycles (not only in clothing but in tropes and genres used in stories). One of the top phrases we constantly heard at fashion school is that fashion is evolutionary, not revolutionary (except for Dior’s New Look when hemlines drastically changed because WWII ended but there’s always an exception to every rule!) and everything happens in cycles which I think is applicable to most things. You are all over social media—Twitter, Tumblr, Pinterest—and thousands of subscribers on YouTube. What’s it like to create content specifically for other people? I honestly don’t feel like I’m creating content for other people. I feel like I’m so lucky to be able to use these platforms to gush about the things I love and that other people are willing to listen! YouTube or BookTube has one of the strongest communities of any I’ve interacted with and it’s so nice to see the same people commenting on all of my videos and for me to be able to have conversations with them. I always get super awkward when people ask me to do Q&A videos or to answer any questions about my personal life because I’m like uhhhh aren’t we just here to talk about our love of books?! Speaking of social media, let’s talk about your Instagram. It’s gorgeous. Too many people rely on filters or pre-made text overlays to dress up their pictures, but yours thrive on color and composition. Where do you get your inspiration? And how many attempts to get that perfect shot? I think it’s safe to say that most of my time and attention goes into my BookTube channel! I’ve been really lucky lately to be working with different publishers on promotional campaigns for new releases and I want to continue doing so. I think the biggest feat I will be undertaking soon (sorry Andrew- the last one took over 10 hours to edit) is to film an updated bookshelf tour. My bookshelf tour from last year has surpassed 100,000 views and pretty much every time I upload a new video, several people ask when I’m going to do an update so I think it might be time. Plus I’m just loving my new rainbow shelves and I want to show them off! 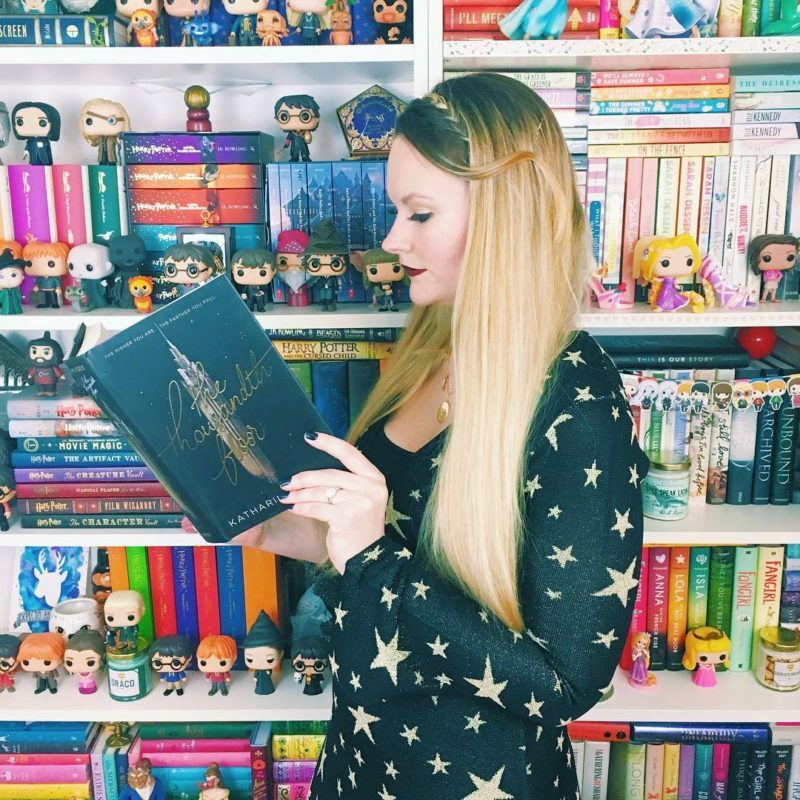 I’m also co-hosting the BookTube Awards later this year and my friend Alexa of Alexa Loves Books and I are working on a summer book blogging event (similar to the Book Blogger’s Love-A-Thon that I co-hosted this past February). Who’s the best Seeker in the world? Ooooh I think I’d have to go with Viktor Krum. He was playing Quidditch professionally by such a young age. Veronica and Betty, or Fred and George? And that’s it for week 4. My thanks to Kristin Hackett for letting me pester her about content creation. I feel like Arthur Weasley asking her questions about the Muggle world.